This 26.46 acre coastal project proposes to build a 139 room hotel, a 203 room resort, and 758 parking spaces along the west side of State Route 1 in Sand City. 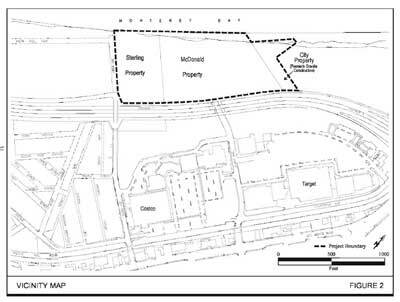 The project site consists of three properties: the Sterling/Calabrese property, the McDonald property, and the City’s property formerly owned by Granite Construction. The project applicant is King Ventures. The project includes the construction of a hotel, resort and parking lot. The project is guided by the 2002 Sand City General Plan. A decision on the Final Environmental Impact Report scheduled for November 2013 was delayed until December 2013. 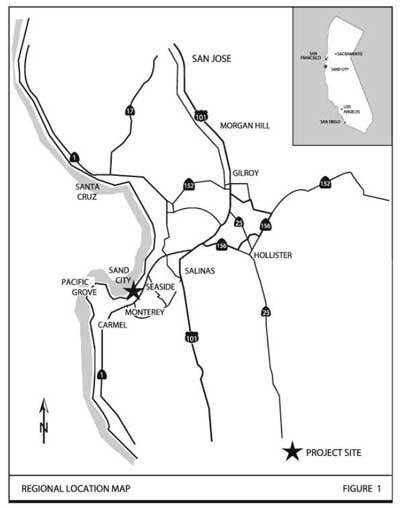 This map shows the project in relation to Monterey County. This map shows the three properties that map up the Collections project. US Fish and Wildlife Service has not been consulted regarding impacts to endangered species. (FEIR, p.50). The extent of mitigation needed to address impacts could affect the final project design. Additionally, the analysis of cumulative impacts on endangered species is inadequate. Finally, the Monterey Peninsula Regional Park District has indicated potential harmful impacts to the Eolian Dune Preserve from public access. Mitigation measures proposed in the FEIR may not ensure that the impacts will be mitigated. The California Coastal Commission states, “In short, the DEIR has not adequately addressed potential higher risk coastal erosion scenarios, particularly when taking into account reasonable estimates for its economic life, and it cannot be assured that the project has been adequately sited and designed to address hazards. Accordingly, the DIER must identify the project’s expected economic lifetime and evaluate higher risk coastal erosion scenarios, including a minimum of 75 years, and take into account recent estimates of future sea level rise.” We support this finding.